BB Roofing - Fascia/Soffits/Guttering, Roofer based in Caterham, Surrey. Invoice history based on 160 reviews. 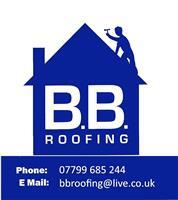 BB Roofing is a Surrey and Berkshire based roofing company with over 20 years knowledge. Offering a reliable and professional service from minor repairs to complete new roofs. We are fully insured with public liability and a proud member of the CPA (Consumer Protection Agency) who guarantee your improvements for up to 10 years. Please call us to discuss your requirements, or for free professional and helpful advice. Ascot, Bracknell, Camberley, Caterham, Coulsdon, Purley, Sanderstead, Sandhurst, Selsdon, South Croydon, Wokingham.